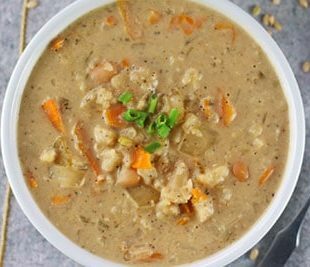 This Vegan Colcannon Soup is a twist on the Irish classic. 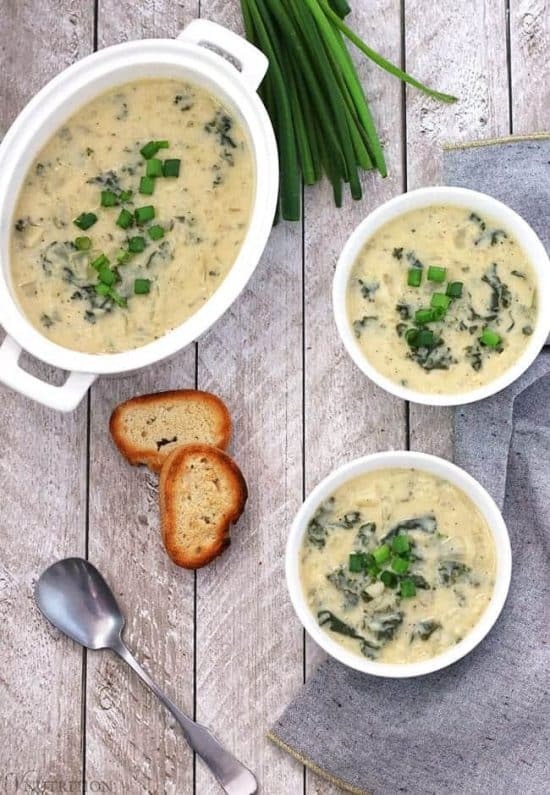 This creamy soup is filled with potatoes and kale and is perfect for a St. Patrick’s Day celebration or anytime you need an easy-to-make warming meal. This Colcannon Soup recipe is both kid and meat-eater approved! I grew up mainly with my Irish side of the family so potatoes were a big part of dinners when we got together. If there were leftover mashed potatoes, my Nana would make them into potato pancakes the next day. Anytime I have some creamy potatoes, I think of my Nana and the good times I’ve shared with her and it makes me so happy. Lately, though, potatoes have gotten a bad rap because of the low carb craze. While I agree that sweet potatoes offer a bigger punch nutritionally, it doesn’t hurt to have some regular old potatoes sometimes. I made some Cauliflower Mashed Potatoes (a mix of cauliflower and mashed potatoes – so good!) so check those out if you’re looking for another healthy potato dish. White potatoes, like the russet kind I used in my recipe, are not processed like white bread or pasta, they’re a whole food that contains some vitamins and minerals we need (like potassium and vitamins B6 and C). 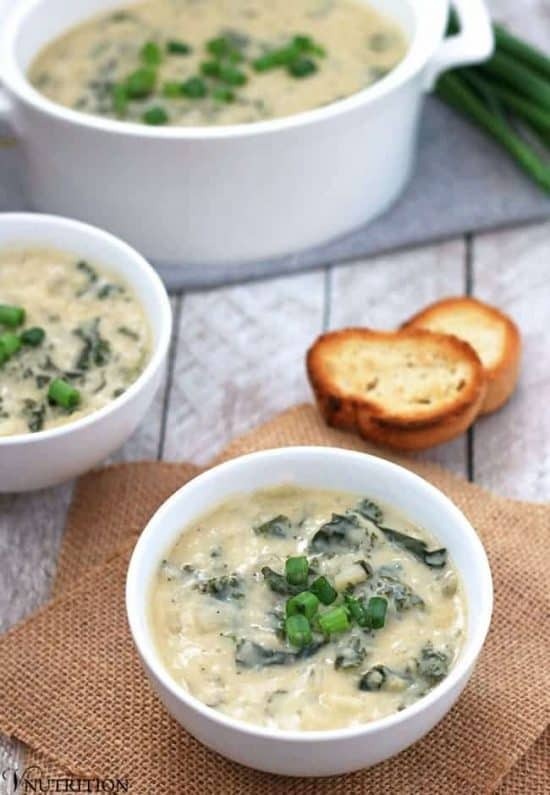 So let’s give our friend the potato a chance – especially in this tasty Vegan Colcannon Soup! While my family loved potatoes and made them often, I never had colcannon growing up. I’m pretty sure that had to do with the fact that my family didn’t eat vegetables (except random canned ones) so we never had kale or cabbage for anything. Once I tried colcannon, I loved it! 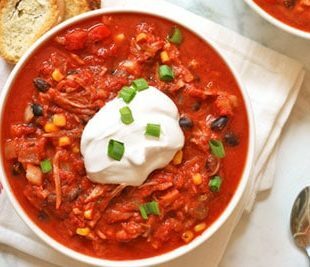 Adding 2 of my favorite veggies together? Yes, please! I thought about doing a regular vegan colcannon, however, in the winter I always crave soup so I decided to do a soup version still using onions, potatoes, and kale. I think it turned out really nice and I hope you do too! I’ve made this vegan colcannon soup recipe numerous times while testing and still can’t get enough of it. I think I’m going to try a version with cabbage too and I’ll keep you updated on how that works. If you make my vegan colcannon soup recipe, let me know what you think by ★ star rating it and leaving a comment below. 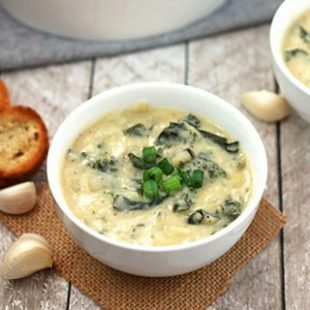 This Vegan Colcannon Soup is a twist on the Irish classic. 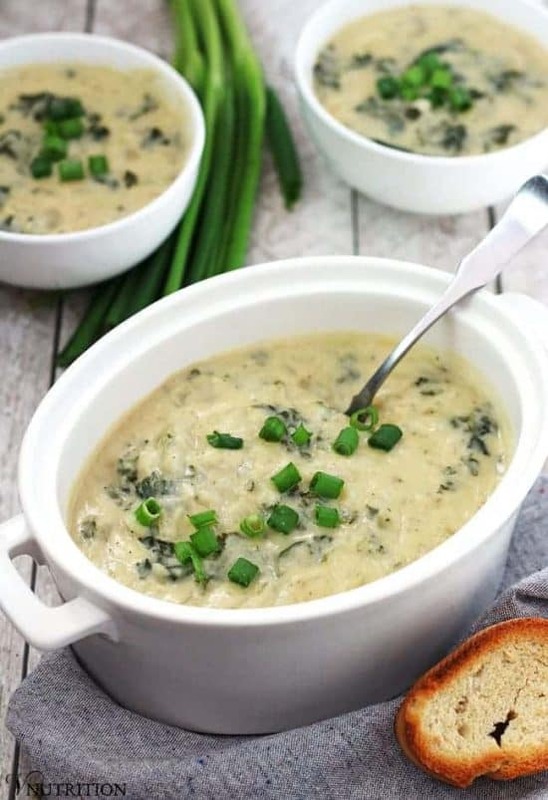 This creamy soup is filled with potatoes and kale and is perfect for a St. Patrick’s Day celebration or anytime you need a cozy, warming meal. Heat oil in large pot. Add onions and garlic and cook until onions are translucent (3-5 mins). Add vegetable broth, potatoes, salt and pepper to pot and cook covered on medium until potatoes are fully cooked and are starting to break apart (about 20 mins). While the potatoes are cooking, add cashews and water to a high-speed blender* and blend until smooth. Once potatoes are cooked, mash them a bit with a fork so that half of them are broken apart. Add kale to soup and cook for a few minutes until kale is done to your liking. Add cashew cream to pot and stir until fully combined and cook for another few minutes. *I use a high speed blender like a Vitamix when blending the cashews. Like my Vegan Colcannon Soup recipe? It would be so wonderful if you could give it some love by sharing! Great idea to turn it into a cozy soup! 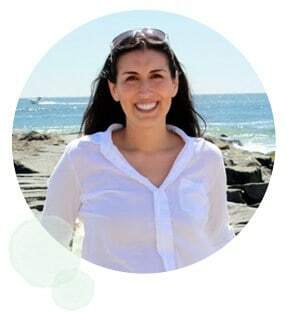 Hey Mary Ellen, I happen to be part Irish and love finding new recipes to try. This looks amazing and I will be giving it a test drive. Thanks for yet another great recipe! Thanks so much Barbara! I really hope you like it! I love colcannon. I love that you turned it into a soup! Thanks Diane! I wanted to do a vegan take on it then figured why not do a soup since I love them so much?! Thank you so much Melissa! I know you’re a potato fan from all of your amazing soups with potatoes! I still need to make your “clam” chowder! I love Colcannon and a soup. ….. WOW! Thank you! When do you add kale to your version? At the end? Hi Cindy! I can’t believe I forgot the kale! I went over the recipe so many times and still forgot it. This looks & sounds absolutely lovely! …but I don’t see the Kale? It appears to be missing from both the ingredient list & the recipe directions. Yes, I can’t believe I forgot it. I updated the recipe! I’ve heard of Colcannon, but I never really knew what it was. You soup looks amazing! I can’t wait to make it. You’ve got some of my favorite ingredients here! This looks wonderful and reminds me of a dish I used to love at an Irish restaurant in Florida, can’t wait to try and thanks! Ooh, was it a vegan restaurant? In south Florida? I go down to the Miami area a few times a year so let me know if you have any recommendations! They totally do Linda! I hope more people jump on the potato bandwagon! kale in soup itself convinced me to try this:) great ingredients.. Thanks Uma! I hope you like it! This is so original! I need to make it as soon as possible as it’ll make me feel at “home” once again. Stunning photos by the way! Let me know what you think when you try it! I’ll be awaiting your decision becasue you know what real colcannon tastes like! This looks so creamy and delicious! I certainly don’t need any persuading to eat more potatoes. I love them! ahhhh!! Cashews to make it creamy! YUM!! What a wonderful idea. I bet this tastes amazing. This sounds good! I’m going to have to make this for our St. Patrick’s day supper! If it’s another way to enjoy potatoes, I’m in. Plus I just love soup. Thanks Nicole! Any way to enjoy potatoes is good with me! I love potato soup, and this one looks so festive for St. Patrick’s Day! Yum! Thanks so much Sarah! Excited to eat it for St Patty’s day too! 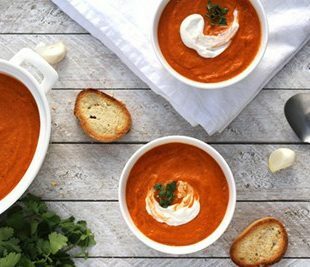 You can never beat a good soup and this looks like a real humdinger! Thanks so much for taking the time to take part in Meat Free Mondays. I love your Meat Free Mondays Jac! Thanks so much, I have been enjoying this soup a lot lately! Where did you up date the recipe? I can’t get it. Hi Ida, I’m sorry I don’t really understand your question. The recipe is above. Are you having a problem seeing a specific part of it? This is the first time I’ve tried cashew cream. Oh my gosh!! Best soup ever! My soup hating 11 year old son even inhaled a bowl! Thank you! Candace, I am so glad you liked it. And that’s such a compliment that your son liked it too. I really appreciate you letting me know – that made my day! Love that the creaminess comes from the cashew nuts, thank you so much for sharing with #EatYourGreens. The Round up will be up later today. Happy April. Thanks Shaheen! I’ll check it out! Oh wow! I’m glad to know it works in an Instant Pot too. I’m hoping to get one for Christmas so I’m going to try this way then. I’m so glad you liked it Amanda! This was soooooo yummy!!!! I made it yesterday for St. Patrick’s Day since I couldn’t have the corned beef and cabbage. I ate the entire batch between yesterday and today and I’m going to make another batch because it was so good! Thank you so much Jen! I’m so glad you liked it so much! I am going to try this recipe on St. Patrick’s day when my family comes over for brunch. My husband is highly lactose inntolerant, so this is a perfect option for him. One question, how much water do you add to the cashews? Just enough to cover them or slightly more? Hi Val! When soaking the cashews I usually just add slightly more water than covering them because they swell up a bit with the water. After you soak them, rinse and discard the water. I hope you enjoy and have a lovely brunch! What can be used as a substitute for cashews? I am deathly allergic. Hi Crystal! Some substitutes for cashews could be almonds, sunflower seeds, hemp seeds, or sesame seeds but I’m really not sure that those would work the same way. I’ve tried them in other recipes and they’re just not the same as the cashews because the sauce doesn’t get as creamy or as smooth, especially if you don’t have a high-speed blender like a Vitamix. If you do try it, let me know how it turns out. I made this soup tonight, I added mushrooms because they were in the refrigerator and I needed to use them…this soup is absolutely delicious! Thank you for sharing! Best for Paddy’s Day! My family love this one. Tasted great – thanks for the idea!